I was set to kickoff our sermon series on Romans this semester, and we realized we wanted a more interactive method for handling questions & answers that we couldn’t get to Live. 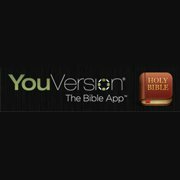 Since half the room at our University focused church is using YouVersion’s Bible app on their Android or iOS devices, we figured it was a good chance to kick the tires of YouVersion’s Live Events feature. 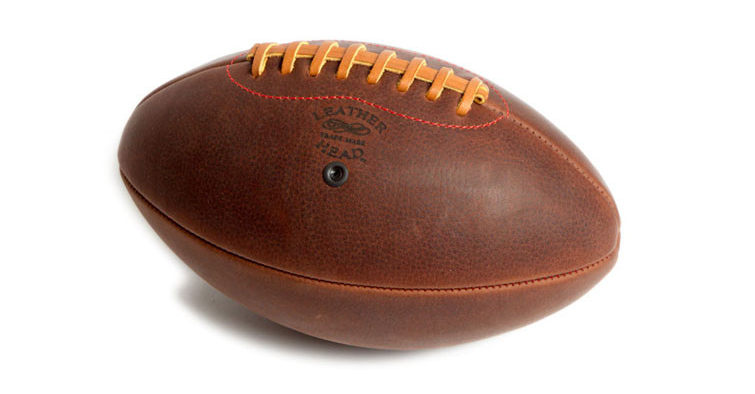 It’s been around since 2009 or so, but we hadn’t used it. 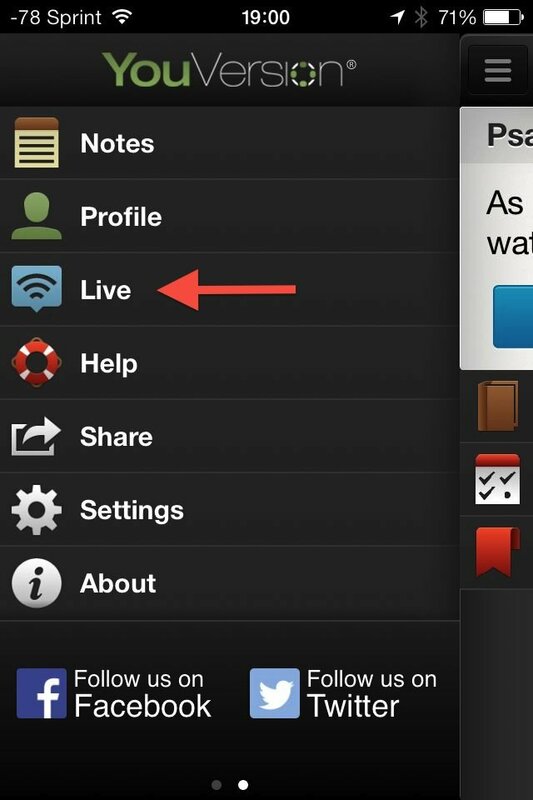 YouVersion Live Events — What Does It Do? Participants can do things like jump to the passage you’re preaching on (in a pre-selected translation), submit questions, respond to a poll, click thru to a web page or video, or even do a quick share to Twitter of that killer sermon point you just made. Group setup involves the name and location of your church, in part to make it easier to find from mobile phones. Step two is setting up a new event, and you start with title, start and stop times, and how long you want the event visible (maybe it appears 48 hours before the sermon in case people want to read ahead). Adding questions and interactive links is as easy as drag and drop. That’s it! Once you’ve setup your event, and the event becomes Published, users can find it on their phone and interact away. Lots of this has tons of potential. 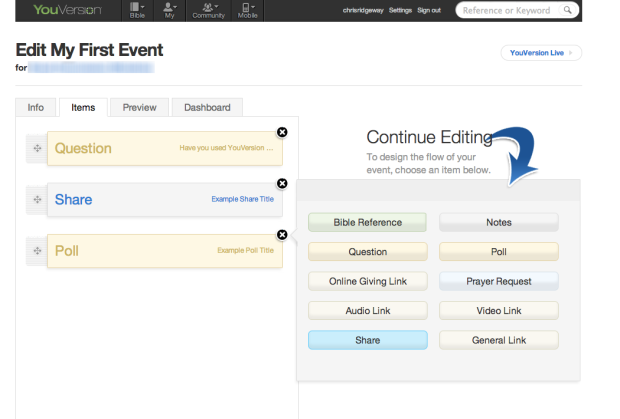 Drag and drop features allow you to build a custom experience each time for those following along with your sermon. At it’s simplest you can provide digital versions of scripture or links that would only be as a paper handout (watch out trees), or on the big screen, which requires people to quickly scratch down your references if they want to remember what you’ve done. But better yet is using those ubiquitous smartphones as interactive devices: polls or questions or prayer request forms giving people a way to interact in a way that is usually impossible in large groups. The poll questions can even be thrown up on a large screen (via web browser) for instant results in the service. 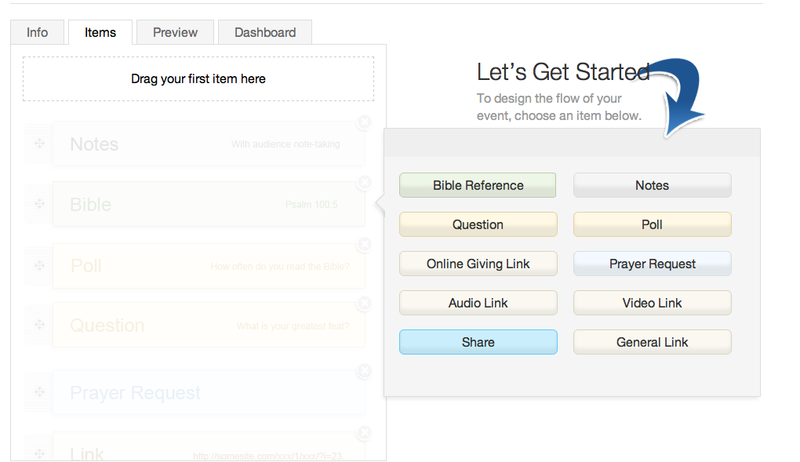 With some creativity, this is a platform that can help encourage better engagement in learning Scripture. Argh! While I’m excited about the potential, here’s the rub: it’s buggy. I counted more than 10 bugs while trying to setup my event, and ran into “Undefined,” error screens, or missing links several times—something you don’t expect from a publish product that isn’t in Beta. Tougher still, it needs a good going over with an user experience designer. Examples include being forced to put in an event end time (not all churches work to the minute) or clicking the X to back out of setup screens even after settings are saved successfully, or choosing the Dashboard Tab which launches you unexpectedly out of the question editing interface with no way to get back except the back button. Sure, it’s navigable if you’ve got a easy-going tech savvy person clicking through the setup process. But the church secretary or your older pastor probably aren’t going to cut it here. The most difficult missing feature is at the beginning of the process: you can’t work together with anyone else. Events are established under Groups, but if you weren’t the one to setup your group (i.e. your church), you can’t ever setup or administrate a event (i.e. Sunday service). It simply doesn’t work. I ran into this early on. My only choice was to create a second group with a similar church name or call the guy in my church who setup the group (I just happened to know who he was: YouVersion didn’t tell me) and ask them if they’ll do the whole event setup instead of you. Even in a smaller church, this is a little bit more of a deal-breaker. The bummer is that while YouVersion rolled this out almost four years ago, it’s still got a lot of issues for day-to-day church use. 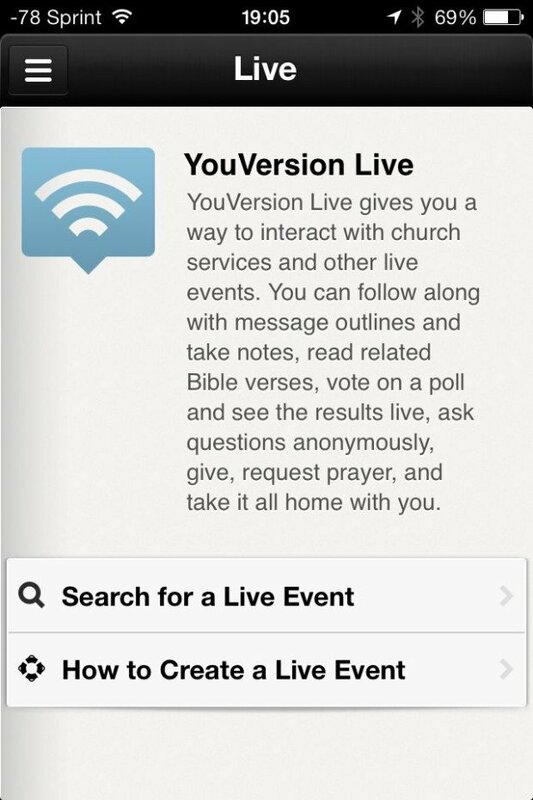 YouVersion Live Events may be your next ticket to an interactive mobile experience for church sermons to come. But with a problematic and buggy interface and with Groups limited to only one user who can create events, it’s not ready for prime time. Nothing is less fun than tech that fails live during a service, and this one may need to stay in the “wouldn’t that be cool if” list until it gets some improvements. 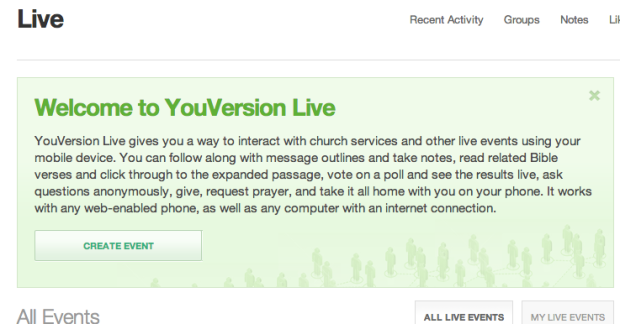 Welcome to YouVersion live. 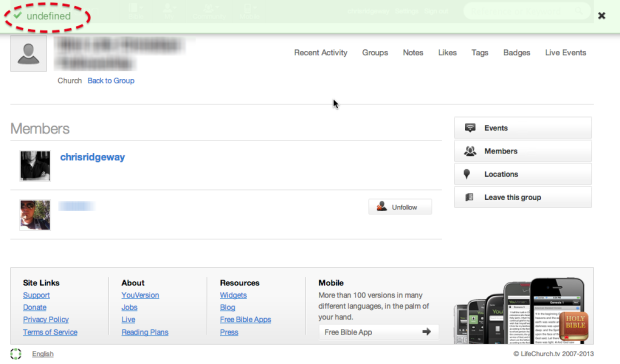 The website interface is where you create events (you can’t do it from the phone). 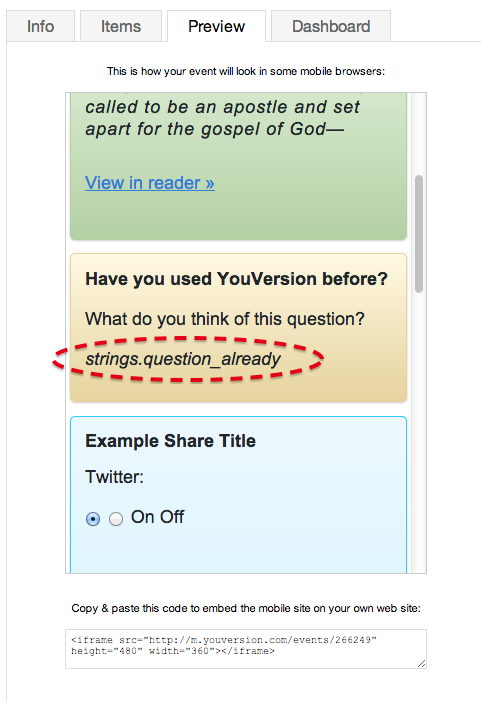 As simple as drag and drop to add poll questions or a scripture passage. Nice! Screens show group membership, but don’t show that someone is actually the only allowable admin (took a long time to figure this out). Unfortunately unfriendly errors popped up all over the place. I’d think twice about that church secretary or less-techy pastor using this. I’ve used this for our church for several years and have experienced all the issues you mention. My biggest feature request is a way to use a previous service as a template. It’s frustrating if you have similar fields that have to be recreated week after week. I keep hoping this will be updated, because it really is a great tool. We used to use you version live events and It took forever to put everything in every week. 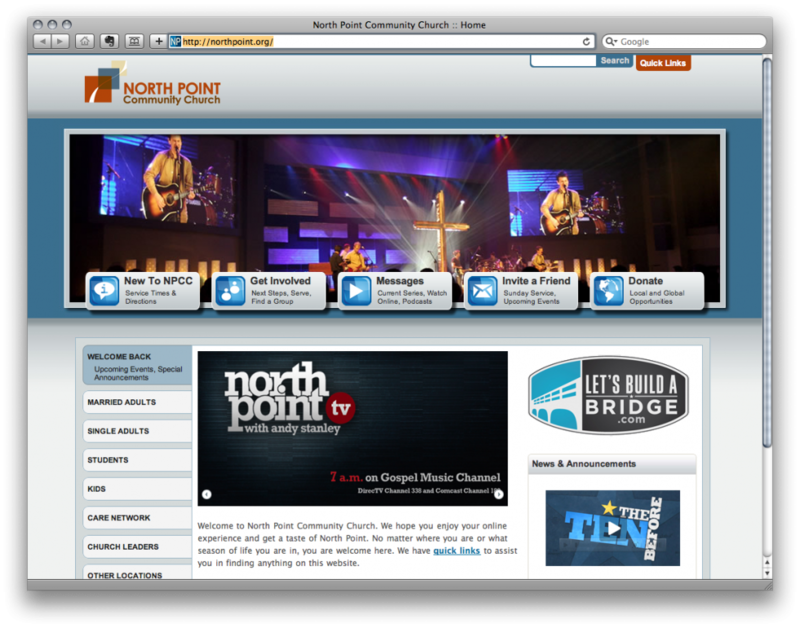 We now use are church domain with a temporary redirect to a blog entry with all of our Sunday things. Exp. Domain.com\sunday. More dynamic with pictures and embedded video. Mike – yeah, I saw others asking about the duplicate function as well. I’m guessing the YouVersion team is great (and love that their Bible app is so widely distributed), but it seems like we shouldn’t hold our breath on this getting bug fixes or an features update: as far as I can tell it’s been frozen in time since its first release (really a beta without the beta label) and then got pushed down the priority list. :-7 It’s too bad because it has enough potential to make me want it to work well. Cris – yeah building your own works I’m sure: but you’re left constructing all the individual functional parts yourself: like scripture quotes, Q& A module, live polls (with display for the big screen). Although I could picture this working well in wordpress once the right plugins were setup. What do you use for your WebCMS? I used this last time I preached. Had the same experience with the good and bad you mentioned. It’s a great resource with lots of potential, just not quite there yet. Thanks for the post! Thanks for the tip: I hadn’t seen this one yet. I hope they do well! Here’s the trouble though, even if this service works really well, if it requires members to 1. download an app and 2. sign up for accounts, it becomes a pretty big barrier to use. You most committed people might, but many will not. One of the things the YouVersion app could have going for it is that it’s the dominant Bible app, and it’s likely that most people already have it. Even if they don’t, having it packed into a Bible app really ups the motivation to install an app. I had signed up for this and was planning to use it, but the comments (añd a terrible time just 2 change my password have me a bit gun shy. Id like to develop an app for our church. Im an IT pro, but just learning mobile os’s. Any suggestions? Yes, there are SO many things they could do better with the YV Live Events. Even minor things like requiring something in the Notes section of each Notes block rather than just a Title–what if you want a title for the main point and then let the user fill in what he/she wants? Also, unless I’ve just missed it, there’s no way to hyperlink text, add documents, etc., etc., etc. Basically little if any customization. Trade Shows & Conferences: Are They Worth It?